After doing a ton of planning for my closet, I learned a lot about what would make my closet very functional, while making it pretty as well. 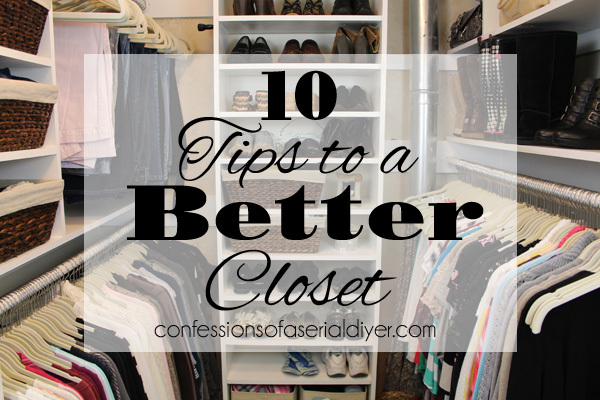 So, I shared ten tips to improve your closet. Today I am bringing this one out of the archives for this months Get Your DIY On theme: Organization. 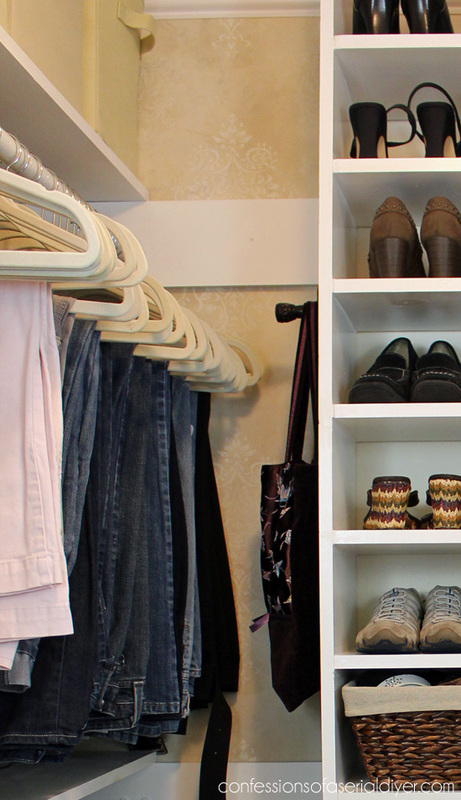 After completing both new spaces, I thought it might be helpful to share what I learned along the way as well my own ideas about how to make your closet work better for you. This post contains some affiliate links for your convenience. Click here to read my full disclosure policy. As you can see, I did my best to maximize this small space. They don’t have to be expensive to look great. Keep a stool or small chair close by to reach those out-of-the-way items. That will make it easier for you to stick to putting things away properly. Store shoes in clear plastic containers like these clear plastic shoe storage boxes with lids . I did not follow this one myself and that is the main reason I am sharing this one. (So just a pic of my favorite Summer shoes here.) My shoes are displayed out in the open and get terribly dusty! Like I said in my closet reveal, I don’t own a lot of beautiful shoes, but if I did that might be an investment I’d be likely to make. 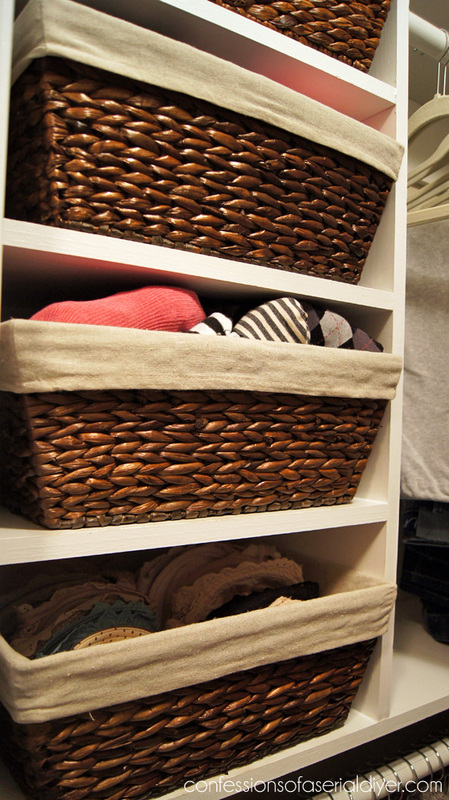 Find a way to incorporate everything you need to get dressed in the morning into one space. I moved all my undergarments to the closet and now I can jump out of the shower and the only stop I have to make is my closet for everything I need. I found these baskets at Michaels, but if they no longer have these in stock, these lined baskets are another great option. 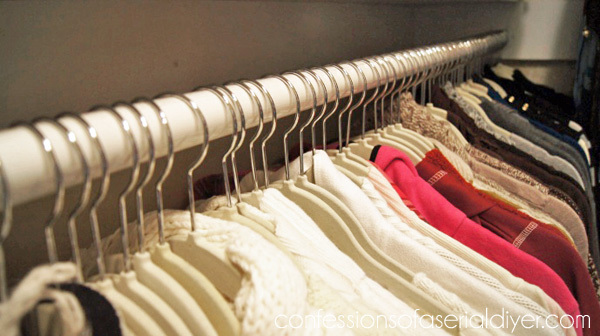 Use all the same hangers! I used to jump at the chance to keep my hangers when the sales woman offered them because, hey, free hangers, right? I also used to be sucked in by beautiful colored hangers. I had three shades of pink, coral, white, all such pretty colors. However, they looked sloppy and mismatched. I finally changed them out for new Velvet Hangers and now they are all the same and make a huge difference! Now wasn’t that worth a replay? You can see where my hubby’s clothes ended up here. Love you guys like sunshine! Hi Christy! Beautifully done. I enjoyed the tips, especially having the pants on top, that makes so much sense. We live in a 1960, and even though we have his and hers they are tiny! I’ve redone it several ways and I’ve determined I have to much. Maybe its time for another overhaul. Here’s to 2015. Thanks for the tips again. Where does your hubby now put his clothes? There is no where else in my house for his to go so we do share. Just wondering. Our master is on the opposite end from the other bedrooms, and they each have a child. Love your closet Christy! 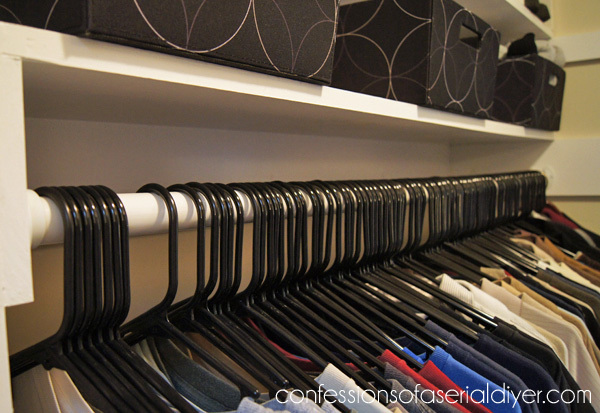 I just made over my much smaller closet (haven’t posted it on my blog just yet though…soon). I love the little dish with scissors and sewing kit, that’s a great idea and I think I’ll add something like that to my new closet! I imagine your last hint is tongue and cheek about kicking your honey out of your closet, so forgive me if I take it too literally. One of the reasons I re-did the master bedroom closet was specifically to make sure sure that we both had room for our clothes. In our first apartment, my husband kept his clothes in the spare room. I felt like a heel every time he’d pad out of the shower and into the other room to get dressed in the morning, but honestly, the closet in our first bedroom was barely three feet long with only a single rack and shelf. When we went house hunting, we knew we wanted a walk in master closet. 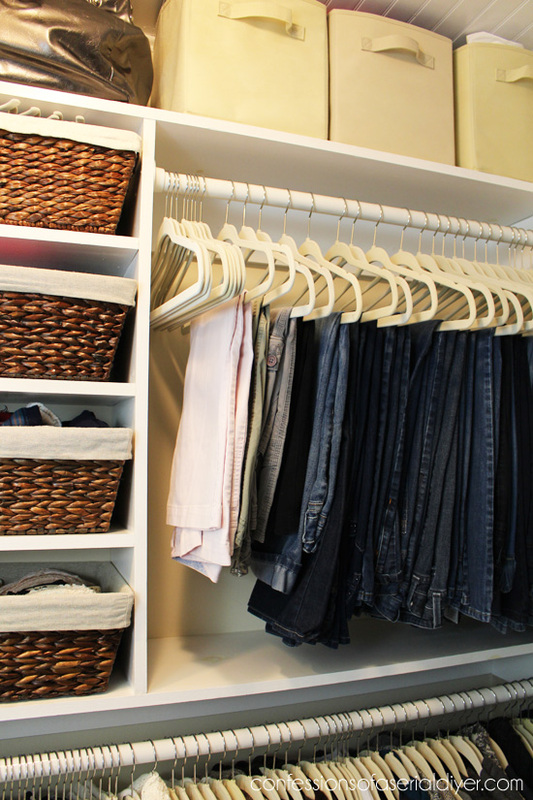 Our closets look to be of similar size – not as big as some of the newer homes, but big enough to be able to customize. I have a ton of shoes and purses, so it was a bit of a design challenge. But we did it. We didn’t split the space half and half. To be honest, I got about two thirds of the space, BUT he’s got all his clothes and shoes in there. 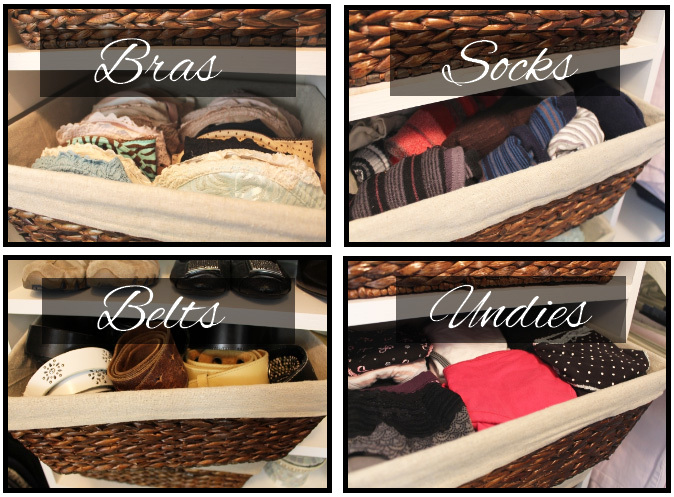 We compromise by putting all our underwear, socks and scarves in the chest of drawers. Works for us. And he loves being able to get dressed in the same room he sleeps in! So, bottom line? Do what works for your both. Husband exile is not the only space solution. Mea Culpa! After posting my previous comment I saw the link to your husband’s closet project. (same room, different closet) All’s well that ends well! And the two closets with the walk space between is beautiful. Great tips girlie!! I am really disappointed you didn’t have “Go out to Arizona”- Thanks for sharing!! Love these tips, Christy! 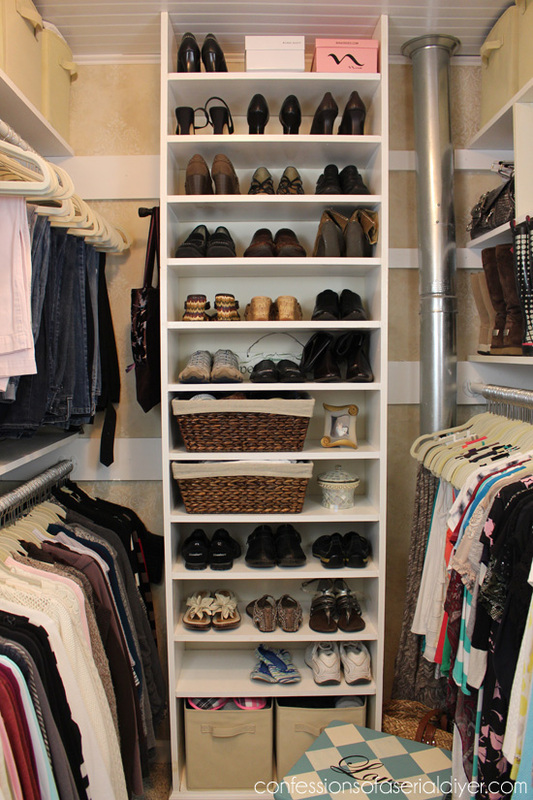 Our current closet is minuscule, but a walk-in is definitely on my “must have” list whenever we decide to move. Yours looks gorgeous! Have a wonderful weekend! 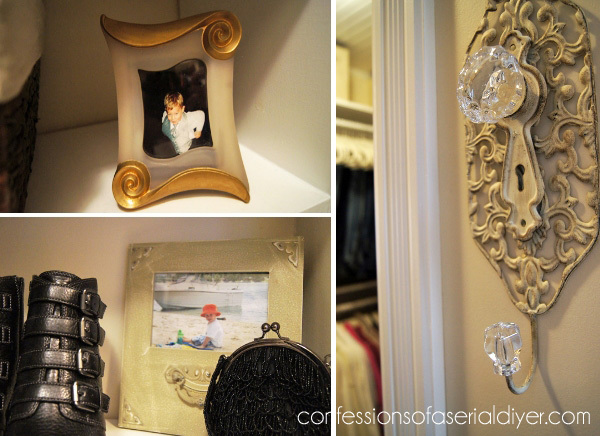 AWESOME closet makeover Christy!! Our master walk-in is on my to-do-list for this year! Wow, Christy! 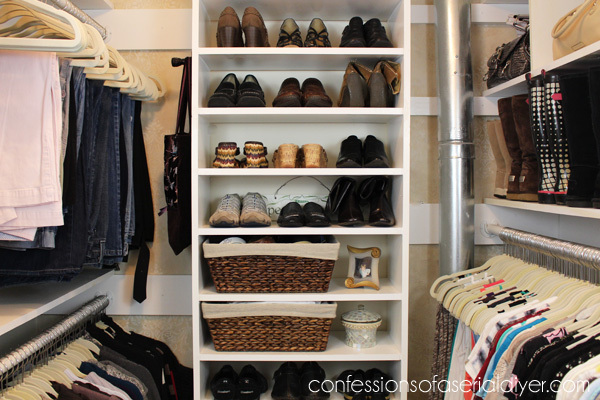 How awesome is your closet! I need to tackle ours after seeing yours! Looks amazing! That’s one organized closet! 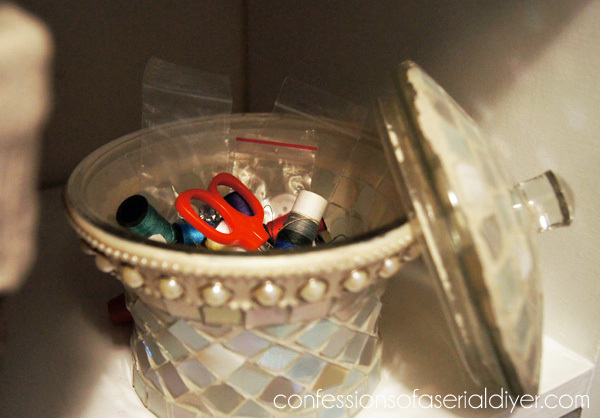 I love your idea of a sewing kit jar…doing it! I’m with you on using the same hangers and clear plastic totes for shoes. Same with using matching baskets. Being an organization junkie a functional and visually pleasing closet makes me happy. Do u have a hanging area for longer items like dresses? I did not include a space for long hanging items, but that’s because I have very few of them. I made the right side of the closet’s hanging bar high enough to hang shorter/knee-length dresses and anything longer than that, I just pull the hem up and attach it to the top of the hanger with clips. It has worked perfectly!